Boomer and Nightwing take down some thugs in short order and talk about how lost and confused Kara is. Cut to Kara dancing in some club where everyone is dressed like DC heroes or villains and Kara is ruminating about how there are so many heroes in the universe so why do they need her, can't she just be a normal kid, etc. Suddenly there's an explosion and we find semi-long-lost Teen Titan Terra fighting the... Empathosaur (I wish I was kidding, folks). It's a big talking dinosaur that can read people's emotions and change his face to look like someone from people's memories. I reaaaaaaaaalllllly wish I was kidding. As they battle the... Empathosaur (Mental note: smash head through desk later) Terra talks about having to prove herself to the world and doing the hero thing because she wants to help and wants to earn people's trust, and Kara doesn't have to do that because Kara wears "the S". And Kara hems and haws about not knowing what she wants and eventually they defeat the... Empathosaur (Mental note: gouge out own eyes later). Kara then mopes in the darkness of her apartment, watching video of Superman being Superman and eating ice cream. Boomer comes over and walks right in despite it being 3 am (are they living together? Mental note: find a good long rope and a strong rafter to dangle from later). So Boomer convinces her to go out on the town with him to... scare some tourists? And Kara, despite spending the entire issue thinking she doesn't want to be Supergirl anymore, wears a big S on a dangly necklace when they go out. Oh, and then I washed my brain with bleach to pretend none of that ever happened. Story - 1: Something is rotten in the state of Denmark. The book opens with a note from Eddie telling us this book takes place after Supergirl #10. Really? Issue 12 comes after 10? But perhaps Eddie meant this comes between issues 10 and 11, which would make more sense as it's a direct interruption to the action and "cliffhanger" ending of Supergirl #11 (A deus ex Power Boy? Mental note: drive railroad spike through brain later). This wasn't what issue 12 was solicited as. Which makes me think issue 13 is the new issue 12, issue 14 is the new issue 13, and pink is the new black. This issue offers nothing for Kara. More of the same "I don't know who I am! *POUT*POUT*POUT*" stuff we've been dealing with for two years. And as I keep saying, that can be a really good story, but only if you finally tell that story and stop sitting on page one for 12 issues. So why was this issue here? Why wasn't it the solicited issue 12, even though at this point I have little hope it will be much better? Well folks, this is one big commercial! Yes, I just paid $2.99 US for them to advertise to me (Mental note: buy the Superman Returns DVD, Final Fantasy V Advance, Rush City, Magic: The Gathering cards, Magical Starsign, DragonBall Z Budokai Tenkaichi 2 (what? ), Time Spies books, Batman Confidential, Destroy All Humans 2 and Killzone Liberation later). No, that was just a futile attempt at humor. You expect the ads in the comics, it's part of the business. So then what ad am I referring to? I'm referring to Supergirl #12. Written by Jimmy Palmiotti and Justin Gray, penciled by Amanda Conner, heavily featuring Terra (who gets more character moments in this one issue than Supergirl's gotten in two years). So just how is that an advertisement, I hear you wonder? Well let me tell you, my friends! A new Terra will be getting her own miniseries after appearing in Supergirl #12. 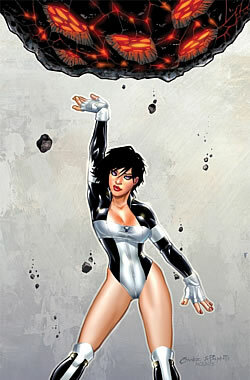 The series will be written by Jimmy Palmiotti and Justin Gray, with illustrations by Amanda Conner. Yes folks, we just got a 22-page preview of the all-new Terra miniseries. You know, Kara's played second fiddle in her own title more than enough, I think. And she's gone nowhere and done nothing for two years. And now an entire issue was wasted on a preview for a miniseries for another character. No offense to Misters Palmiotti and Gray, or Ms. Conner. Their series might be fantastic (But EMPATHOSAUR?! That doesn't fill me with lots of happy, guys.) The empathosaur might actually have worked if done tongue-in-cheek or played for humor. Then it might have been kind of charming. Instead, it's played serious and it is woeful. But this was just blatant advertising with no other point wrapped in a Supergirl comic, and that really ticks me off (Mental note: stab something juicy later). Art - 4: I've not seen any of Amanda Conner's art before. It's a bit cartoony, but I like it a lot. Given more exposure to it I think I could really grow to be a fan of hers. There's lots of personality and, you know, different faces. Cover Art - 4: The image is totally irrelevant to the issue. And there's the "peel down" featuring Terra in the upper-right corner. 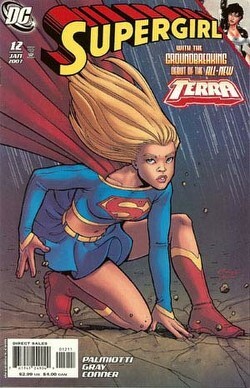 And the big "Terra" logo with the bad pun... those bring down what is otherwise a fine piece of generic Supergirl art. Amanda Conner, you're going places, and you might have just found a new fan.